Can you believe it is nearly December already? There’s a certain anticipation in the air; an excitement building; time to start thinking about presents…. That’s right, it’s RC time! Which means we are VERY close to the gift of a new version of NVDA. With NVDA 2017.4 in the final phases of testing, we invite you to download the current “Release Candidate” build. Release Candidate 3 was released on 30th November 2017. Not to mention all the usual improvements, fixes and updates. Edge works better than ever. There are new Braille translation tables (Croatian grade 1 and Vietnamese grade 1). Browse mode works a little more intelligently, and heaps more. Press NVDA+n to open the NVDA menu (remember the NVDA key will either be INSERT or CAPS LOCK). Press N for “What’s new” – or down arrow to that option and press enter. As we usually do, the RC, or release candidate builds come out a couple of weeks before the final stable build. All going well, this third RC build will be the same as the final version (except for the “rc3” in the version number). You do need to manually download and install the release candidate builds. When the full version comes out, both stable and release candidate builds of NVDA will prompt to update (if update checking is enabled on the general options screen). Since Windows XP is no longer supported, the update will detect if it is running on XP and will not install. If you are not already on NVDA 2017.3, (the last version to support XP), you will be invited to install that version. Microsoft has introduced several new security features recently. One of which is Windows Defender Application Guard. This is a way of isolating websites in Edge to prevent them from taking advantage of exploits. NVDA 2017.4 is able to work in Edge when Windows Defender Application Guard is enabled. Another new security feature in Windows 10 is Controlled Folder Access. Designed to stop malware, it prevents programs from accessing secure Windows folders. This feature is disabled by default. If enabled, one limitation is that when you install or update programs, they won’t be able to create a shortcut on the desktop. This is also the case for NVDA. We recommend disabling Controlled Folder Access (if enabled), before installing or upgrading NVDA. Still on Windows 10, someone recently asked about our post from early 2016, when we recommended waiting before upgrading to Windows 10. At the time, we had concerns about the usability of the new Edge browser and other applications such as Mail. Although many users prefer Firefox (and currently we recommend the ESR version) or Chrome, Edge support has come a long way. Edge support is once again improved in NVDA 2017.4. Mail is also much more accessible than it was early last year. Microsoft have worked to resolve issues raised by NV Access, and others, in Windows 10. Does your hardware support Windows 10? Not only the PC, but your printer, speakers, braille display and anything else you use. Does your software work on Windows 10? If you are using older software, it may not work under the new operating system. For Office, Microsoft state that Office 2010 and later work on Windows 10. Office 2007 hasn’t officially been tested, but does run, and no claims are made about Office 2003 or earlier. Are you confident doing an upgrade of Windows yourself? If you pay a computer shop to do the upgrade for you, then that is a cost you will need to take into consideration. If you are confident in your technical skill, NVDA will work up until the computer restarts during the upgrade. After restarting, use Windows+control+enter to run Narrator, and then use NVDA again once the upgrade finishes. Your documents and programs should still all be available after the upgrade. It is advisable to back everything up before you start in any case. Press control+alt+n to start NVDA. Press NVDA+control+g to open the general settings. Press tab until the focus is on “Automatically start NVDA after I log on to Windows”. Press spacebar to toggle the setting. Ensure that it is “checked” if you want NVDA to start after you log in. Press enter to save the setting and close the dialog box. In other news, Mick and Quentin have both been allowed out in public recently. Mick ran a session on NVDA at OZeWAI: The Australian Web Adaptability Initiative conference in Canberra 20-22 November 2017. 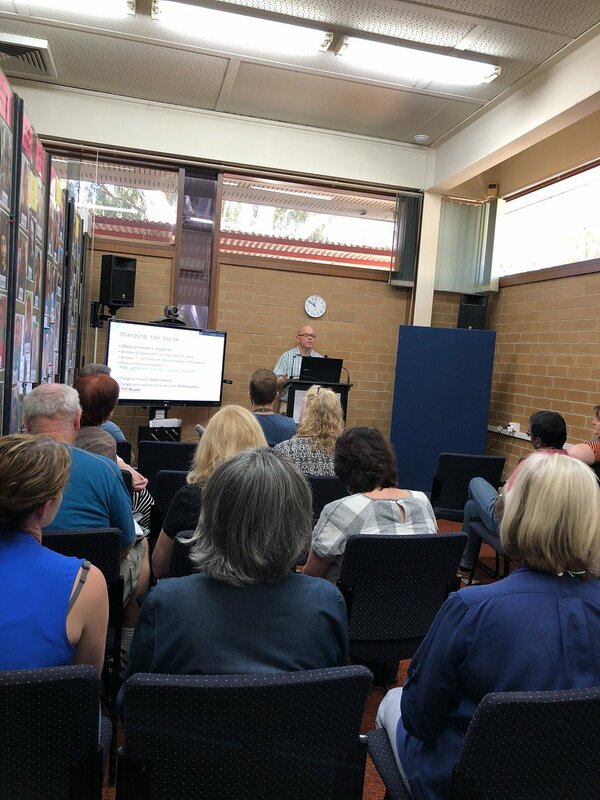 Quentin went to the Statewide Vision Resource Centre (SVRC) Expo in Donvale (Victoria) and also presented a session. Everyone wants to know about NVDA, and the audiences at both events were large and very interested. Do you know of an event being organised that would benefit from the NV Access touch? Let us know! We can’t promise to attend everything, but we have a much higher attendance rate at events we were aware of than those we didn’t know about. Lastly, a reminder that NV Access is still on the lookout for a QA Engineer. If you have the skills and can work in Australia, or know someone who might be interested, we’re still taking applications. That’s all for today. Enjoy the start of your December and we’ll be back again before Christmas!